Keep colors bright and text tight with our proprietary toner and 1200 x 1200 dpi resolution. Audiences will notice smoother gradations between colors for more lifelike reproductions. Add professional finishing in-house with several automated options. Use the Internal Multi-Fold Unit to automate four different types of folding, including tri-folds and z-folds. Use the 1,000-Sheet Hybrid Staple Stapleless Finisher and create document sets without staples in schools and other environments where staples are discouraged. Take advantage of six paper sources, including large capacity trays, for incredible versatility and extended runs. Use the 100-Sheet Bypass Tray for labels, envelopes, thicker stocks up to 300g/m² and 49.6-inch-long banners. Print SRA/12.6" (SRA3) output with crop marks and color bars for high-end projects. Organize every project with a convenient 4-bin mailbox. Reduce misfeeds with auto-draw paper trays. Swipe. Pinch. Flick. Scroll. Use Workstyle Innovation Technology to simplify the way you work on the all-digital 10.1" Smart Operation Panel. Choose from multiple interfaces and create your own workflow shortcuts. For specific tasks, such as printing files from shared folders, simply download an app from the Application Site. You can also use the site to access Smart Operation Panel how-to videos. Add plug-and-play or third-party workflow software solutions to automate tasks from the Smart Operation Panel. For example, Streamline NX combines print and device management, accounting and authentication modules in one convenient platform. Or, use Equitrac Office® for output reduction and device usage. Print from your personal device. With the Smart Device Connector app, you can touch your smartphone or tablet to the printers Near Field Communication (NFC) tag to connect quickly. Access information from cloud applications such as Google Drive™ and Dropbox™ via any web browser. Add an available dual network port to give visitors the same freedom to print on a second network. Use passcodes or an optional NFC card reader to track user activity or set print quotas for specific users. Add Device Manager NX Accounting or other optional software to issue chargebacks. Use Locked Print to hold print jobs until the authorized user releases them. Keep tabs of meter reads for the SP C842DN and your entire fleet with @Remote™ Office NX. 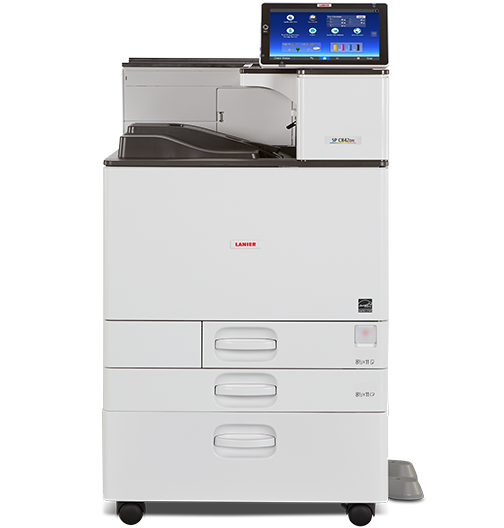 Reduce paper costs with default duplex printing, and save energy while in Sleep Mode. The device is also ENERGY STAR™ certified, meets EPEAT® Gold criteria and offers Typical Electricity Consumption (TEC) of 1.7 kWh/week.